I agree…totally disturbing and inappropriate for young children, regardless of their culture!! My 10-year old granddaughter even found this short to be disturbing. Totally agree!!! My daughter is having nightmares about this. The whole thought of someone doing that to someone else has her waking up crying and she is a mature 7yr old. For adults, a great little short as I get the metaphors but metaphors for little kids, where adults eat their kids? Wtf??? Thank you for reading my blog! And thank you for your thoughtful post. I can understand why your granddaughter was disturbed. It disturbed ME and I'm 59. When the living dumpling screamed the first thought I had was "Oh my GOSH – she and her husband just ATE 5 of them!!!" When I did my movie review feature as a guest on kbys.fm Sports' Show Sunday at 8:20 AM CST which you can access live online, (notice the little plug I gave there LOL) one of the hosts asked about the comparison to The Gingerbread Man. The major difference is that the Gingerbread Man story was comic and a fable about the dangers of CHILDREN running away from home and the bad things that might happen to them. It's a comedy and no one is attached to The Gingerbread Man in any anthropomorphic way or vica versa. 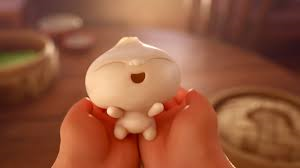 In Bao, the "mom" developed an emotional maternal bond with the dumpling and the dumpling responded as a child – then when the dumpling grew up she ATE him/destroying him, NOT because he had done anything wrong, but because he wanted to grow up and leave home – a very natural and mature and normal thing to do. This may be fitting as an "art house" project but certainly NOT appropriate for a short to be shown before a children's movie. My wife and I also looked at each other totally shocked when we saw the mother eat the “child”. We said “did our eyes just see that?” I didn’t know if I should cover my children’s eyes, or what would happen next. I hope there was no permenant trauma to them. I have seen several people trying to explain that I just don’t understand this short film because I don’t understand Asian culture. Welll.. I guess I did not previously understand that Asian’s were racist cannibals who would eat their children to prevent them from marrying non-Asians. If it is common for Asian mothers to eat their children in order to prevent them from marrying non-Asians… then….. I am not going to even finish that sentance beacuse Asians are not cannibals! I also don’t know any Asians who are racist enough to stop their children from marrying non-Asians. So, seems to me this short film depicts Asians in a very bad (and untrue!) light. Why would someone do that? The most distrubing part was the eating of the “child”. Totally innapprorpiate for a children’s movie. Obviously someone failed to do their job. This should not be the opening short of a kid’s movie! I am 34 years old and it slightly tramatized me! I did not get a chance to see the beginning of the short, but I can piece together from context and my wife confirmed for me. I am sure that Pixar, Disney and the director/writer of this short did not think this was inappropriate for kids. I will admit that there are some recent decisions that Disney has made that I do not agree with, but I do not put this short on my list of things that I would stop my children from seeing. In fact, 3 of my boys (ages 8, 7 and 4) were with us when we went to go see Incredibles 2. I saw most of the short and I found it very beautiful and moving. 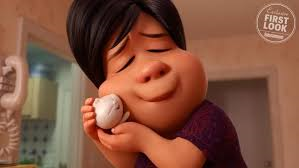 I was a little shocked by the part where the mother ate the bao, but I was more shocked that this part made it to production more than the fact that the mother ate the dumpling. I am of Asian descent and I found this short to be extremely relevant. My wife is Caucasian and I asked her what her initial reaction was to this part. She said that she wasn’t surprised by the mother’s actions and that she found it a little humurous. I actually found that part to be very emotional and I was surprised by my reaction because I have never gotten emotional at a movie (the closest was as a child watching Lion King when Mufasa saves Simba fromt he stampede). My wife asked me if I thought she was a horrible person for thinking this part a little humurous. I told her she was not and that she does not fully understand the culture. I think that this is the key point – She did not understand the culture and her reaction to this part was quite the opposite of mine. As I said in the beginning, I do not believe that this short was made with the intent of creeping people out. My suggestion would be to ask around what peoples’ thoughts were on this short, particularly any friends you might have that are Asian. I would also recommend looking up the director/writer of this short. It might provide you with a better understanding about the short, especially considering that there are a lot of people who liked this short. I also want to add that I asked my 3 boys what they thought of the short. They said they liked it. They also recognized that it was sad. They recognized that the dumpling was supposed to be her son and that it was a dream for the mother. I did not know of the short before I took them to see Incredibles 2 and I do not regret letting them watch Bao or Incredibles 2. I am actually glad that they saw the short. Thank you very much for reading the review and for your very thoughtful and insightful comments. I did look up the writer-director and read some of her interviews. I found it interesting to note that the writer-director is a girl who said she was inspired, or perhaps working through her issues with her mother, who she felt was overprotective. Being a mother and a daughter I can sympathize with both sides. However, my biggest complaint was not in and of the short itself per se, though I did find it very disturbing that she would eat her child even in a figurative sense. My biggest immediate point was that this was shown before a movie geared to children expecting a far more light-hearted experience. I would not, for example, have been nearly as startled had this been shown before Wes Anderson's Isle of Dogs. I have been, frankly, quite surprised and delighted at the number of people who were inspired to read my review on this little short. Your well taken point about the writer-director's point of view has come up before. Therefore, I have put a link, at the end of my review for Bao, to an interview with Ms. Shi published in Cosmopolitan titled: "Here's What the Director of Bao Has to Say to Those Who Don't Get It". I am very glad that your boys were not disturbed by the images but interpreted them humorously, but then you were there to appropriately guide them. Thank you again. And I hope you find other of my reviews interesting. I would like to know your opinions on other reviews as well. I have what I hope is a wide and eclectic variety of movies and film related topics on which I have commented. I look forward to hearing from your family's point of view again soon. Far too many feable attempts to justify content that is inappropriate for the demographic of Incredibles viewers. This is the stuff of nighmares for impressionable young minds. I’m an adult and I was still trying to untangle this peculiar thing well into the movie. Epic fail Pixar. Thank you for reading the review and for your thoughtful response. I agree. While I appreciate the attempt to explain the cultural connection in the other comments, before a movie aimed appropriately for a very young audience is just not the place for it. Hated it. It was assaulting to my poor children’s brains. My small one has sobbed now in bed about that lady who ate her baby. I don’t care about the relevance of the metaphor bla bla bla it may be meaningful to people for a bunch of reasons but to force something like that upon that kind of audience is outrageous. They needed to pick another platform. Really angry about this.